"Funeral of Stanislas-François Jarlin, bishop of Beijing 1"
Funeral of Stanislas-François Jarlin, bishop of Beijing; Fr. François-Xavier Desrumaux, CM, with biretta and cope leading the procession. From left to right: a foreign priest, Fr. 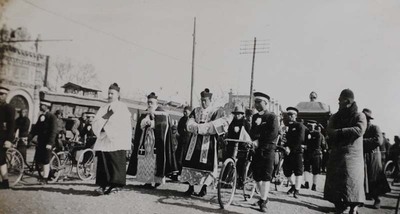 François-Xavier Desrumaux, a Chinese priest, Chinese policemen with bicycles. Funeral of Stanislas-François Jarlin, bishop of Beijing 1. January 1933. Société des Auxiliaires des Missions (SAM) China Photograph Collection, Whitworth University Library, Spokane.